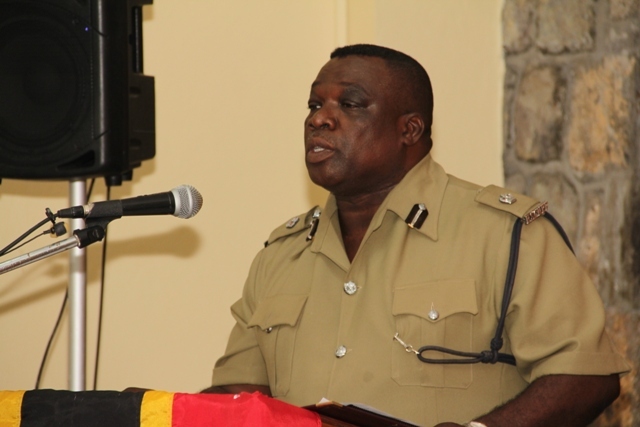 NIA CHARLESTOWN NEVIS (January 06, 2014) — Police Officers stationed on Nevis, were reminded that discipline was paramount in their efforts to maintain the community’s trust and support. Divisional Officer of the Royal St. Christopher and Nevis Police Force, Nevis Division Superintendent Hilroy Brandy, reminded the officers when he addressed them at a New Year’s gathering at the Charlestown Police Station on January 05, 2015. “For us to maintain the trust and support of the community, we have to be disciplined. We are all links in the chain responsible for the Force’s overall performance. We all contribute to its success. We must be so disciplined that we are regular, punctual, energetic, polite, just to mention a few,” he said. Brandy also told his fellow Officers, that they were ambassadors for the Nevis Division and the entire Police Force. “We all play a major role in ‘selling the Force’, by having a disciplined approach to our work. Each of us is expected to be a shining example as this ideal member of staff. “We have just one chance at a first impression, an impression that can influence a person’s perception of our Division and by extension influence whether they give us crucial information,” he said. The Senior Police Officer urged the officers at the Nevis Division to continue to work as a unit. “We must therefore ensure that each time we answer the telephone, accompany a visitor, transport a victim and arrest a suspect, a positive image is given of our Division. “I must reiterate that each of us has a significant part to play in the overall success of the Division. So let us continue to work as a team and to be so disciplined that we can maintain that trust, confidence from the community to achieve our goal,” he said. Remarks also came from Deputy Commissioner Stafford Liburd and Assistant Commissioner Robert Liburd.